Gallup and Knight Foundation’s 2017 Survey on Trust, Media and Democracy found that Americans believe the news media have a critical role to play in U.S. democracy but are not performing that role well. One of Americans’ chief concerns about media is bias, and Americans are much more likely to perceive bias in the news today than they were a generation ago. A Feb. 5-March 11, 2018, Gallup/Knight Foundation survey of 1,440 Gallup Panel members assessed how pervasive U.S. adults believe bias in news reporting is, and whether they make distinctions between bias and inaccuracy. 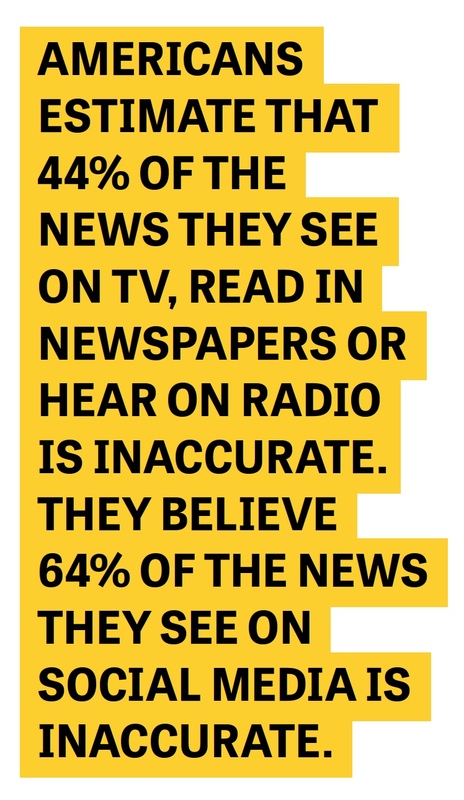 Overall, Americans believe 62% of the news they see on television, read in newspapers and hear on the radio is biased. They are much more inclined to see news on social media as biased, estimating that 80% of the news they see there is biased. Americans tend to think the majority of news reporting is accurate, but they still believe a substantial percentage of it, 44%, is inaccurate. They think 64% of news on social media is inaccurate. More than eight in 10 U.S. adults report being angry or bothered by seeing biased information. A slightly greater proportion of Americans — more than nine in 10 — get angry or bothered by inaccurate information. In rating various news organizations, Americans make little distinction between bias and accuracy — generally, those that are perceived as biased are also perceived as inaccurate, and those that are perceived as unbiased are perceived as being accurate. Republicans’ and Democrats’ ratings of the accuracy and bias of certain news organizations diverge sharply, most notably with respect to Fox News®, Breitbart News®, CNN® and MSNBC®. To a large degree, bias and accuracy appear to be in the eye of the beholder, greatly influenced by whether one agrees with the ideological leaning of the news source. Americans’ perceptions of fairly widespread bias and inaccuracy in news may be unduly influenced by the bias they perceive from the “other side” of the ideological spectrum rather than their own side. Counteracting perceptions of bias and inaccuracy may have a role to play in addressing the lack of trust in the news media and giving Americans more confidence in the media’s ability to carry out its democratic responsibilities. Gallup and Knight Foundation acknowledge support for this research from the Ford Foundation, the Bill & Melinda Gates Foundation, and the Open Society Foundations.